The Polka Dot Posie: Our New Student Planners are Here! Our New Student Planners are Here! 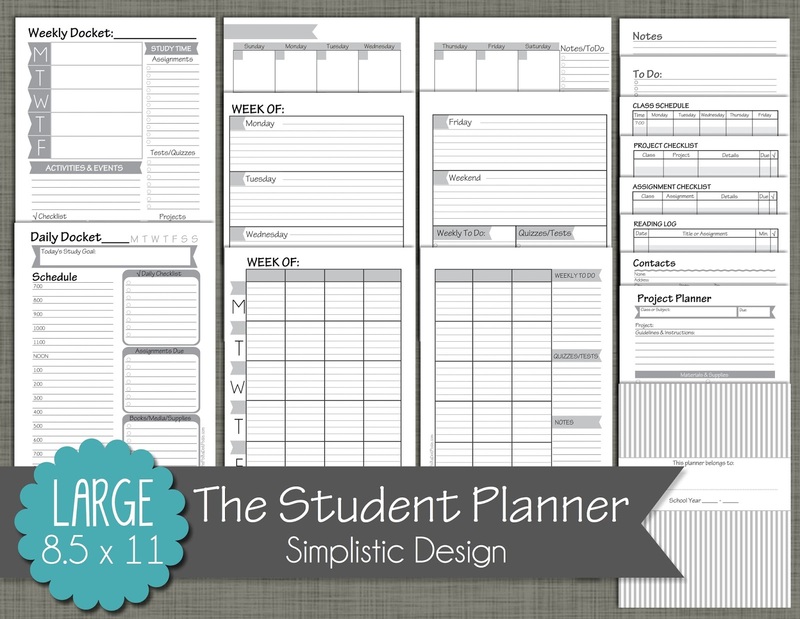 My freshman year of college, I took a class with a professor who required students to use a planner. They gave us all a Franklin Covey planner as part of our book fees, and we were graded on how well we took notes, wrote down homework assignments and used our monthly calendars. I remember the grumbles and moans from all the students as the teacher wrote "How to Use a Planner" on the board. It seemed pretty self-explanatory, right? You have a calendar and you write important things on it. Easy peasy. Our professor, however, said that if we were going to use our planners effectively, we would have to follow three simple tips. Tip #1: Look at your planner every single day. It seems like such a simple rule, but it was surprising how many days I would forget to look at in and then as a result, I would forget an assignment. So I followed this tip and looked at my planner every morning while I ate breakfast. Tip #2: Write in your planner every single day. Even if there isn't an assignment to keep track of or any notes to jot down, the simple act of writing in your planner every day taught you to make it a part of your routine. I remember some days I would just write what I did that day or jot down a to do list. Tip #3: Make your planner your own. Learning to use a planner in school made me a better student. I was more organized and on task when it came to my school work and extra curricular activities, and I truly believe that I got better grades because of that. So if you are a student, or the parent of a student, I challenge you to try using your planner every single day this school year. Look at it, write in it and above all else, PERONALIZE it! The best way to motivate yourself (or your child) to use a planner is to make it your own! We took our boring old University Edition Franklin Covey planners and made them our own with fun pages, comics, stickers and more. I can't say the guys in our class got quite as excited as the ladies, but they still found a way to personalize their pages. So with both types of students in mind, we have designed two different Student Planners that are fun, flexible and easy to use! 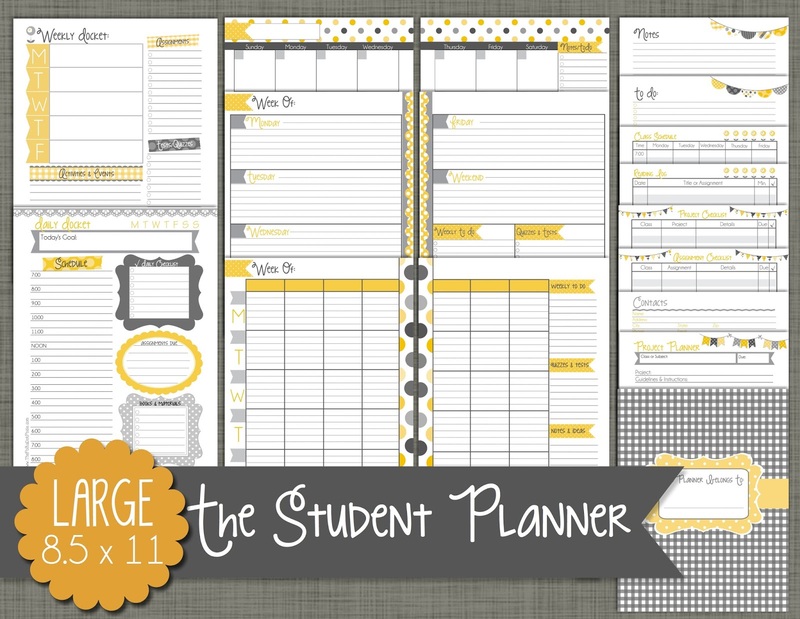 Our first Student Planner option is my personal favorite :) The Yellow & Gray Design is bright and fun and it makes me smile every time I look at it. This design comes in LARGE 8.5 x 11 and SMALL 5.5 x 8.5. 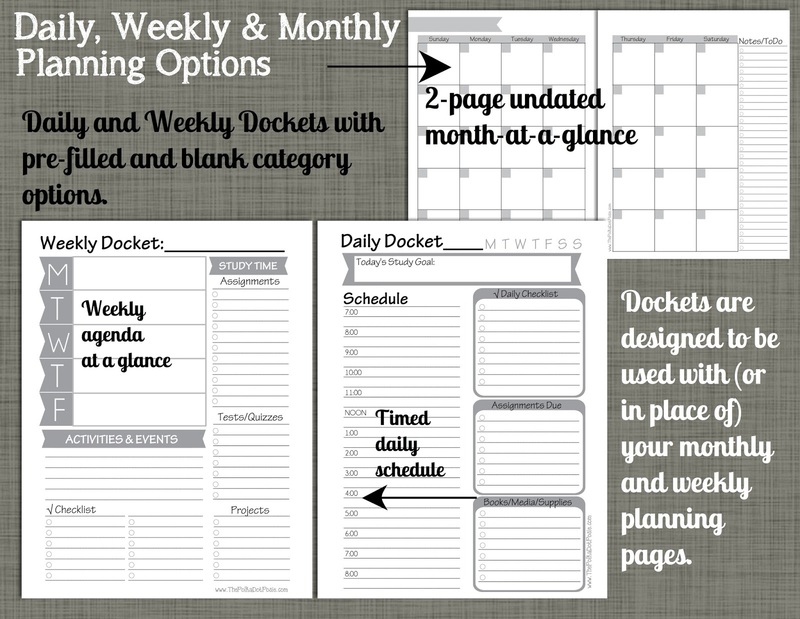 For those of you that have never printed your own planner pages before, let me assure you that although it a process and will require some "project time," the flexibility and customization it offers is worth the work!! 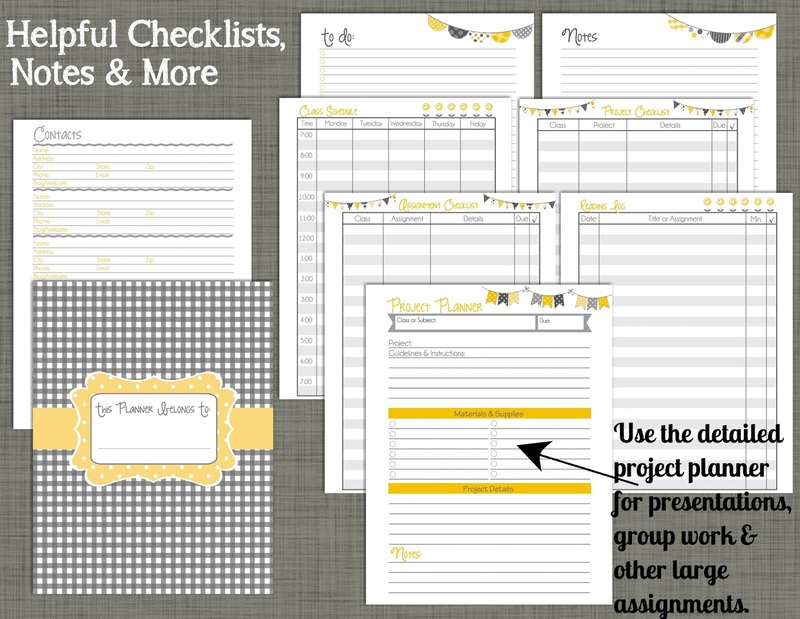 There are a variety of different planners out there from Filofax to Franklin Covey, but if you are looking for an inexpensive, easy way to put together your Student Planner, I highly recommend looking into the Arc and Martha Stewart Discbound systems from Staples. I talk a lot about these planners on our blog and it's because I absolutely love them! This week, I told my 11-year-old neighbor, Patrina, that I would help her put together her student planner for the coming school year. Because our sets come with fun cover pages (or we can design a custom one for you), we decided to go with the Customizable Poly Arc Notebook so that our cute little cover could show through the front. We also bought a set of the plastic tab dividers so that it's easier for her to find what she is looking for. I used my inexpensive DYMO label maker and came up with 5 categories that I thought worked well for the Student Planner. Under the "calendars" tab, I included a year's worth of monthly pages. Patrina plans to use these to keep track of birthdays, special events, holidays and other school programs. She is also a cheerleader so she is going to use it to jot down her games and performances. 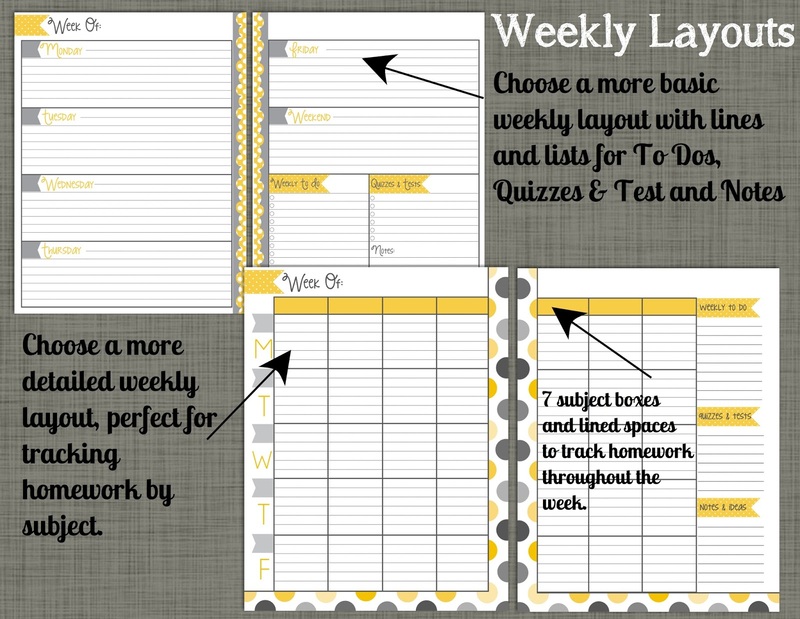 Under the "homework" tab we have included 3 months worth of weekly pages. Carrying a whole school year can get quite bulky, so we went with 3 months to get started. 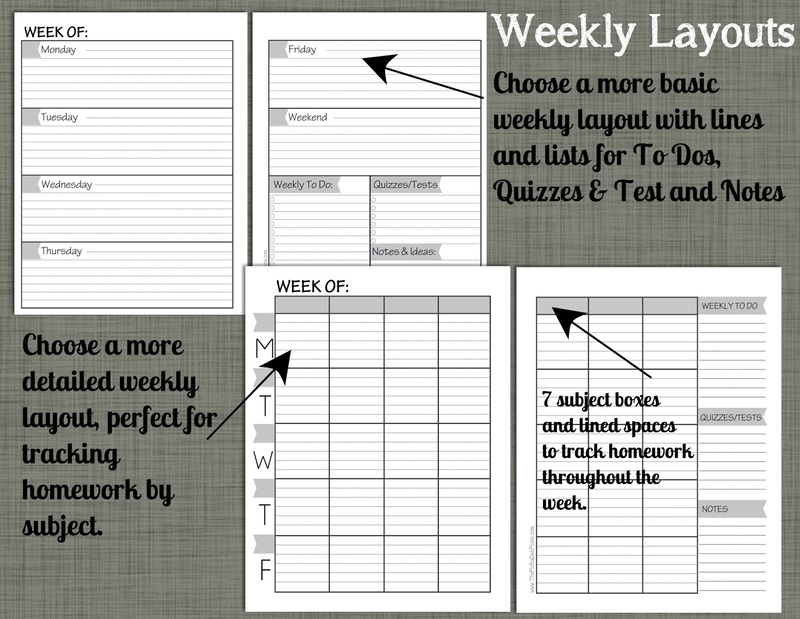 Patrina chose the weekly layout with subjects to help her keep track of her homework assignments under each class category. 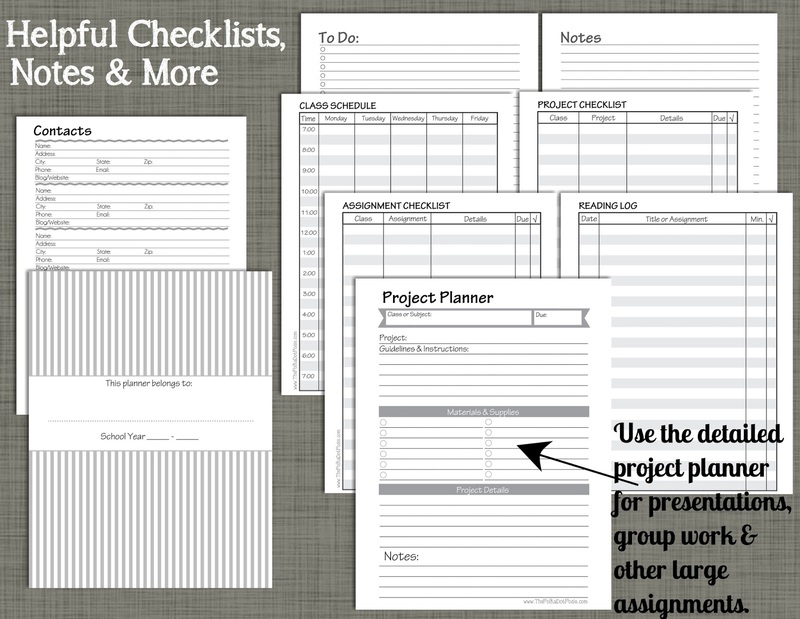 This section is great for using simple To Do lists and our Daily or Weekly Docket pages. We both had a tough time coming up with the perfect tab word for this section, but we wanted a place to house her class schedule, contacts pages, project planners and other important paperwork. So we simply labeled it "important." Every planner needs a good old "Notes" section and the student planner comes with super cute note paper that you can use anywhere in your planner. 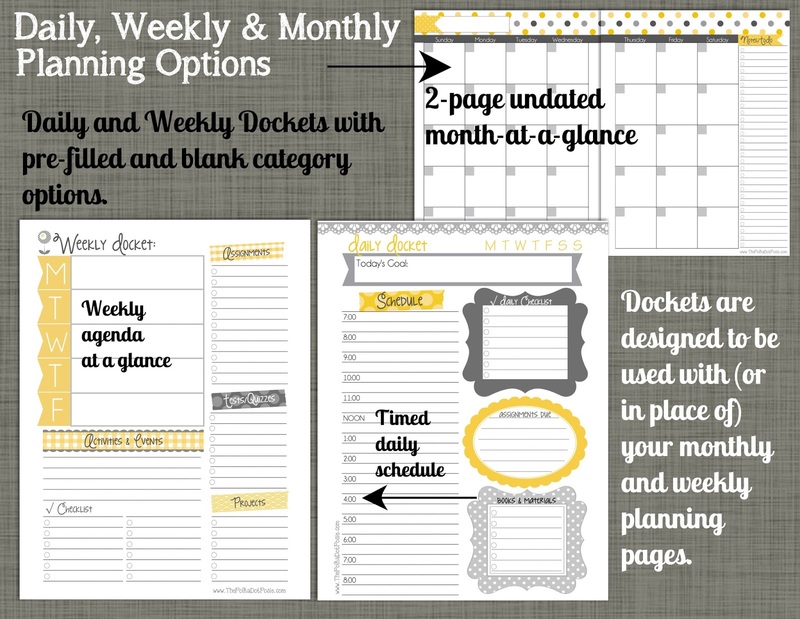 I know all of these pictures showcased the Yellow & Gray planner, but the Simplistic set has all of the same great pages and can be set up the exact same way in your planner! Our file now provides detailed print instructions to help you set everything up from start to finish. But of course, if you have any questions, please don't hesitate to contact us in our Printables shop! We will be back next week with a fun Back-to-School post that will offer some helpful tips for getting you and your kids ready for a fresh new year! And stay tuned for another FABULOUS giveaway and a bunch of new FREEBIES!!! Always look carefully at the picture. Many sites simply use pictures from the official Coach replica rolex site, meaning you may not know what you're really buying until it's too late. Larger, well-established sites will always will include a picture of the reproduction itself. These sites will feature a number of close-ups that allow you to see the fine details and the sewing, as well as one picture with a mannequin to let you observe how it will hold on your shoulder. Coach hermes replica are American classics, and produce your own . these guidelines will help guide you to the Coach reproduction bags of your dreams. FashionLanes. com offers thousands of fashion products that are fashionable, trendy, and stylish. These products include wholesale replica handbags, jewelry, purses and sunglasses, wholesale purses, designer purses, women purses, chanel replica, wholesale designer bags, designer look bags, wholesale western replica dior handbags and much more things. Headquartered in Los angeles, California, FashionLanes. com is well known for its on-line wholesale distribution with shipping available in the united states. In 1961, James Tenney took it one step further louis vuitton replica by taking an existing popular song and drastically manipulating it. His "Collage #1" took Elvis Presley's recording of "Blue Suede Shoes," clipped out portions, rearranged them and played with the fendi outlet tempo. A more mainstream, but less experimental and avant-garde, example of collage came from Dickie Goodman and Bill Buchanan in 1956. Their "Flying Saucer" was a playful mashup of rock and roll hits from the era along with a fake gucci replica news report about aliens landing from outer space. This began when DJs started interacting with and manipulating the vinyl records they played. At first, it became popular to play and replay the breaks in funk music, simply because crowds loved to dance to these parts. Kool DJ Herc is credited with originating this practice, and others, like DJ Grandmaster Flash, helped perfect the techniques, such as changing turntable speeds and turning chanel replica the records manually. He joined other rappers to form Grandmaster Flash and the Furious Five, and the group rose to national stardom with the 1980 single, "Freedom," which sampled "Get Up and Dance" by the rock band Freedom. Such a lot of women absolutely adore colour combination, are around every corner from make believe, adore to trip. will never avoid towards cosmetic as soon as. cartier replica Tidy design: sometimes they consider nail plate clipper, tidy dishcloth, washing liquid. they've been fragile towards go detail not to mention hesitant to enjoy a make an effort. chanel replica Aroma design: for a fragrance from important things. chanel replica there is not any doubting, there can be cologne, bubble teeth. even stop by smelly factor, many would pain some take off so they need many temperament. prada replica Experienced brand: throughout their tote, 50 % stuff are actually give good results mandatory: pocket book, h2o and pencil, treat course, daily news videos. They've been examples of the standard families, and yet with the help of more potent disposition. cartier replica sale Pick up design: many take a look tote for the reason that privately owned gallery: links, older flights, out of date lesser and various other important things.